Conservation of energy, when applied to fluids in motion, leads to Bernoulli’s Principle. Bernoulli’s Principle states that fluids moving at higher velocities lead to lower pressures, and fluids moving at lower velocities result in higher pressures. Airplane wings have a larger top surface than a bottom surface to take advantage of this fact. As the air moves across the larger top surface, it must move faster than the air traveling a shorter distance under the bottom surface. This leads to a lower pressure on top of the wing, and a higher pressure underneath the wing, providing some of the lift for the aircraft (note that this isn’t the only cause of lift, as Newton’s 3rd Law also plays a critical role in understanding the dynamics of flight). This principle is also used in sailboats, carburetors, gas delivery systems, and even water-powered sump pumps! Expressing Bernoulli’s Principle quantitatively, you can relate the pressure, velocity, and height of a liquid in a tube at various points. 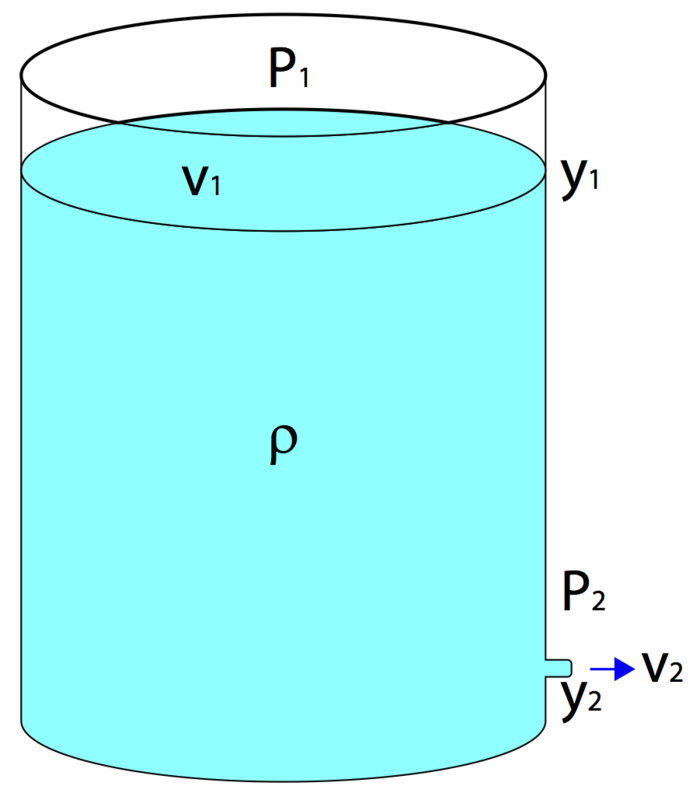 The pressure at a point in the tube plus half the density of the fluid multiplied by the square of its velocity at that point, added to the gauge pressure of the fluid (ρgy), must be equal at any point in the tube. Question: Water sits in a large open jug at a height of 0.2m above the spigot. With what velocity will the water leave the spigot when the spigot is opened? Answer: Since the top of the jug and the spigot are both open to atmosphere, the pressures P1 and P2 must be equal. Since the jug is much larger than the spigot, you can assume the velocity of the water at the top of the jug is nearly zero. This allows you to simplify Bernoulli’s Equation considerably. Since the density of the fluid is the same throughout, you can do some algebraic simplification to solve for v2. This is known as Torricelli’s Theorem. Since the difference in height is 0.2m, you can now easily solve for the velocity of the water at the spigot. Notice that this is the same result you would obtain if you had solved for the velocity of an object dropped from a height of 0.2 meters using the kinematic equations... this should make sense, as Bernoulli’s Equation is really just a restatement of conservation of energy, applied to fluids!